Are you planning a trip to Indonesia? 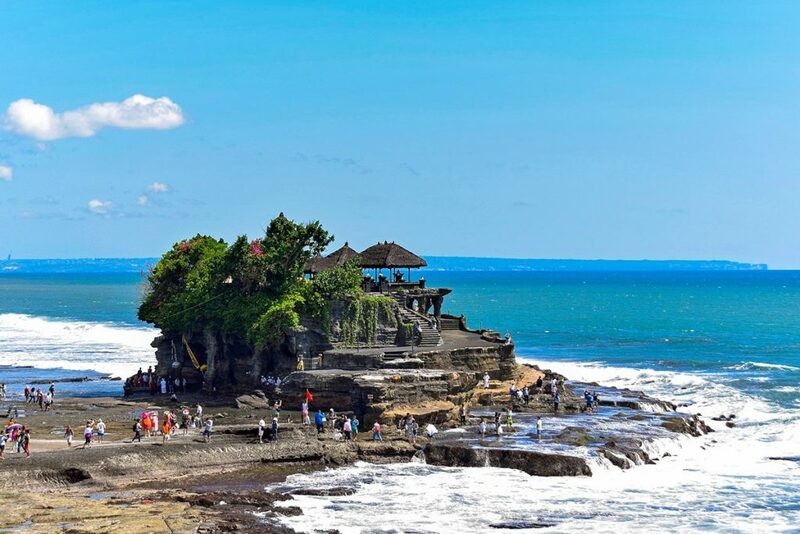 Are you wondering about the best things to do in Bali? Then this Bali travel guide was written for you. I compiled a list of the top tourist attractions and points of interest in Bali. From the most beautiful waterfalls to the best beaches and Hindu temples, culture, beach, and party – there is literally nothing you can’t experience on this amazing tropical island. Best of all: It’s not even very expensive. Pura Ulun Danu Bratan is probably the most iconic temple in Bali. The Hindu temple built in 1633 is, all things considered, not even very large. 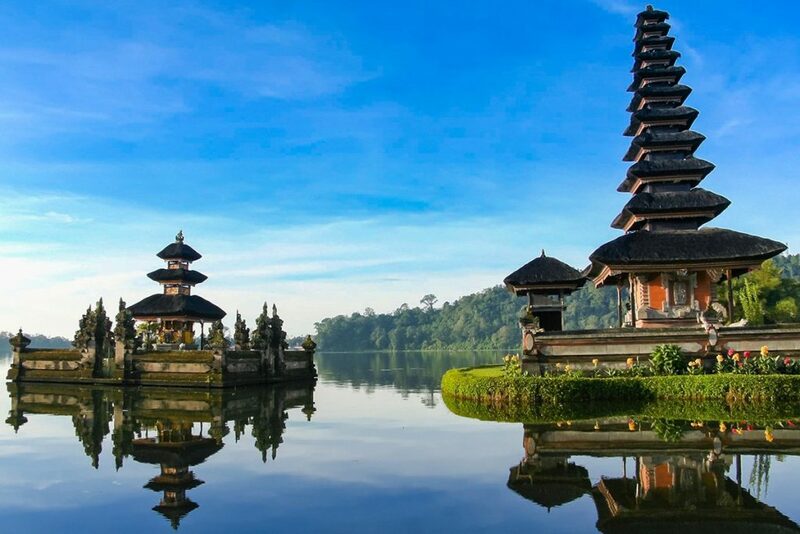 The setting, right in the middle of Lake Bratan and the verdant mountains in the background make it the most photographed temple in Bali. Add the reed thatched pagoda with its 11 stories and the sparkling reflections of the sun close after sunrise, and you really don’t ever want to leave. 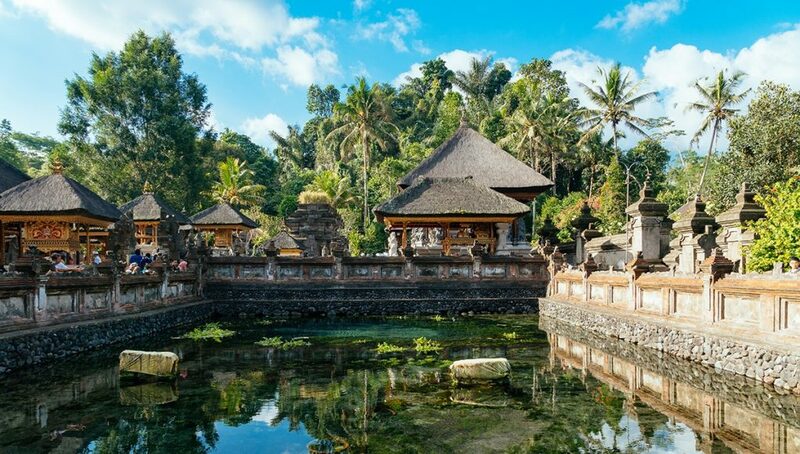 The Bali temple on the lake is best visited on a day trip from Ubud. Note: The temple is actually quite small. If you don’t want to take that perfect picture, I’d actually say it’s not worth it. 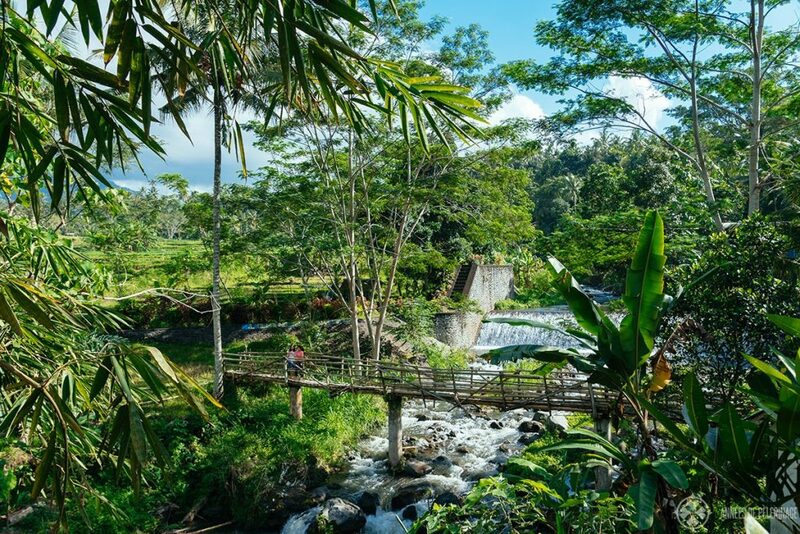 The area around the town of Sidemen was my personal secret highlight in Bali. You see, the Indonesian island can get incredibly crowded with tourists. Sidemen (and pretty much the rest of East Bali) is still somewhat quiet and the landscape so utterly stunning! Here, the rice fields aren’t thronged with people hunting for the perfect Instagram shot, and you can even visit the villages the Tenganan Pegringsingan people, where you can still experience the traditional lifestyle and unique handicraft tradition (especially double ikat weaving). 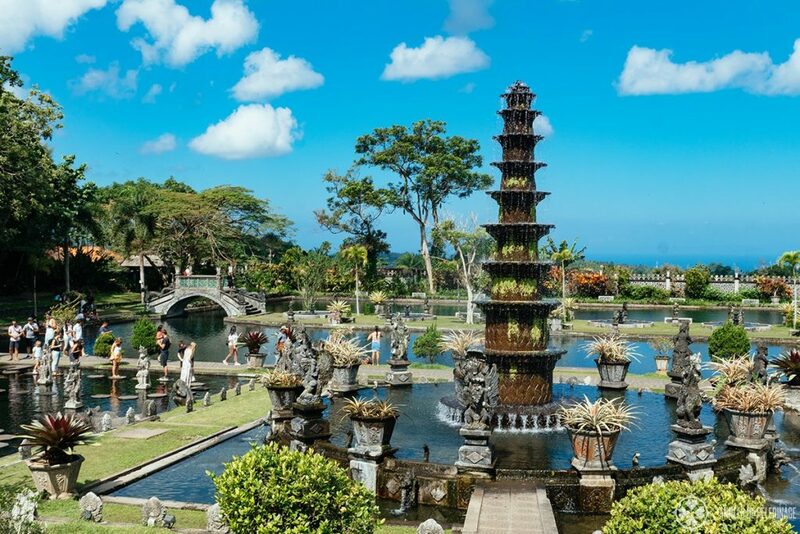 The Tirta Gangga Royal Water Garden is beautiful beyond belief. Among all the tourist attractions in Bali, this one really was my favorite. The water complex was once a royal estate. Contrary to what you might think, it’s not all that old. The king of Karangasem built it in 1946 and it was sadly destroyed by the eruption of the nearby volcano Mount Agung in 1963. What you see now, is a faithful reconstruction – beautiful nonetheless! 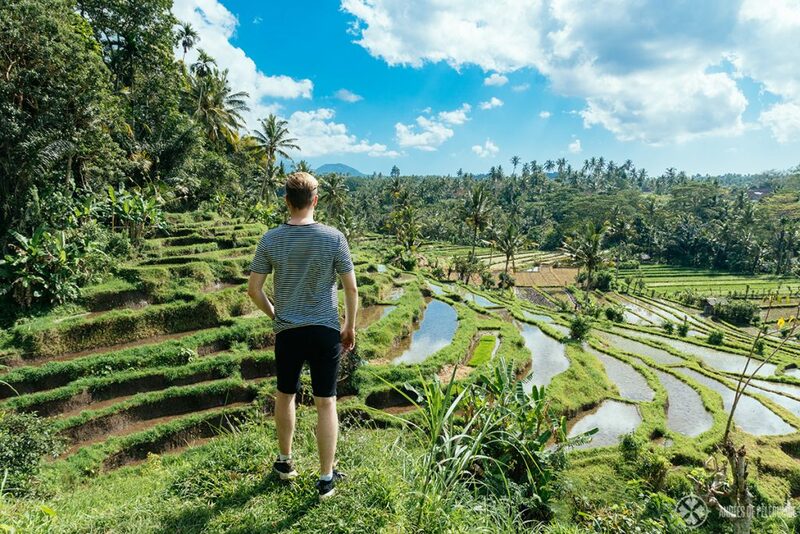 Bali’s rice terraces are so beautiful that the UNESCO declared some of them a world heritage site. 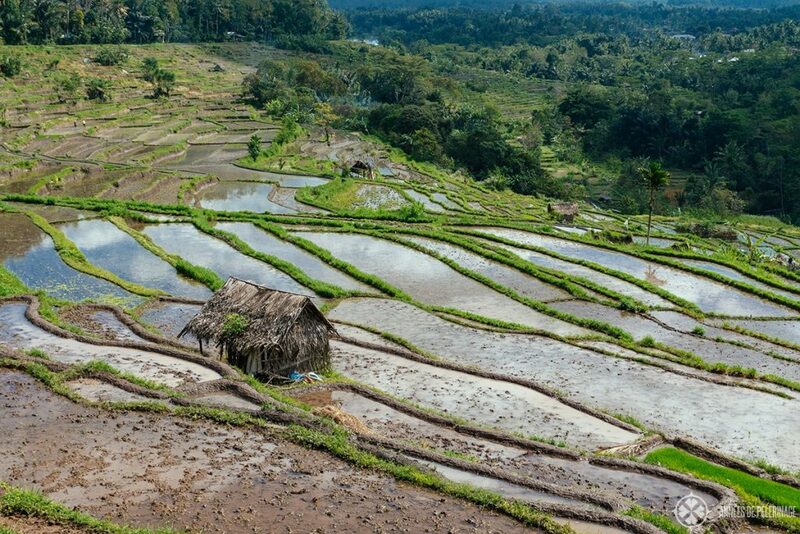 The most popular ones are the rice terraces of Tabanan. They meander along a deep river gorge and scream “take a pictures” from miles around. 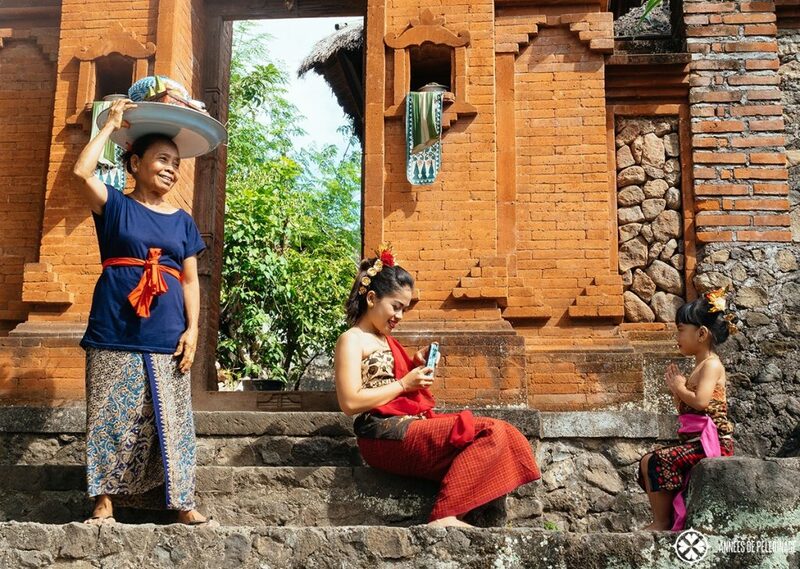 They are considerably touristy and you really shouldn’t expect to experience anything traditional Balinese there. Still, they are pretty. Not far away from Tirta Gangga hides another royal gem in Bali: The Taman Sukasada Ujung Palace. The palace appears to float in a large pond, like an island in paradise. So, definitely put it on your list of things to do in Bali. The royal palace is surrounded by beautiful gardens, with a pavilion here and there. For the best view climb the stairs up to the hill behind the palace and marvel at the beauty below. Normally, I don’t mention foodstuff or performance on my list, as I really want to offer my readers an overview of the landmarks and points of interest to plan their itinerary around. 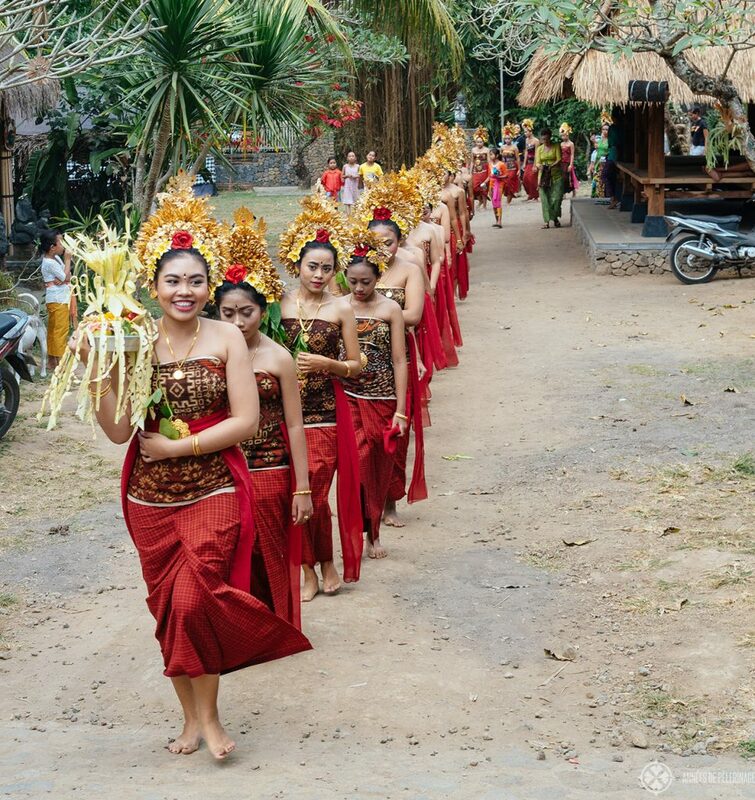 In this case, I do make an exception, simply because you cannot visit Bali without watching at least one traditional dance! 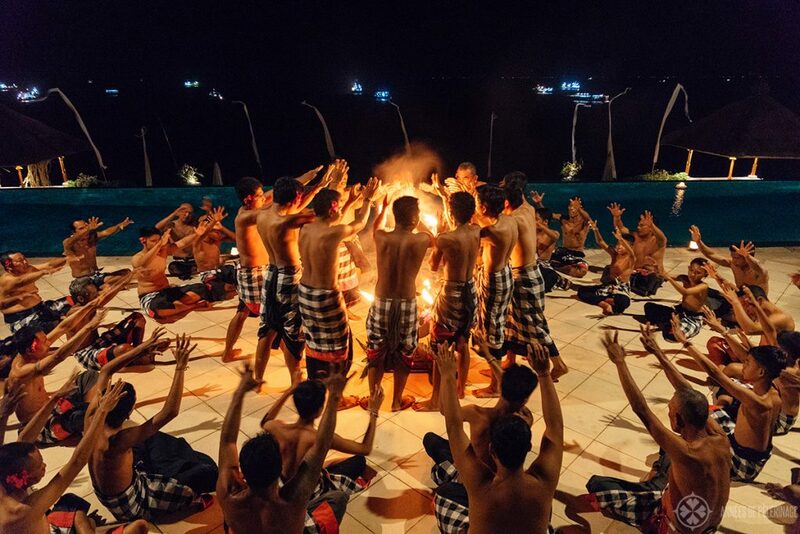 The Kecak is performed solely by male dancers, typically at night around a fire (which is why it is sometimes also called ‘fire dance’). There are many other dances, but I liked this one the most. It is just so expressive, with all the dancers simultaneously and constantly chanting “chak-chak-chak”. Note: Dances are typically performed at temples, so try to watch them there, to get the real deal! 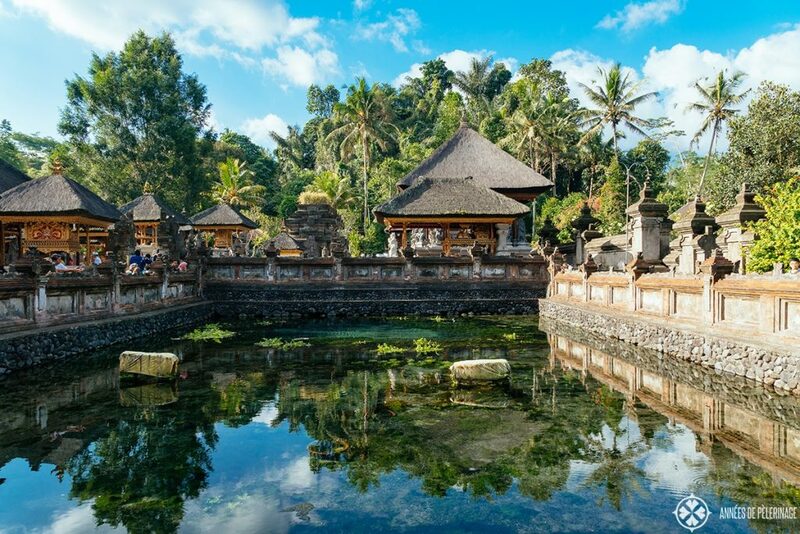 One place you absolutely must see in Bali is the Tirta Empul water temple. 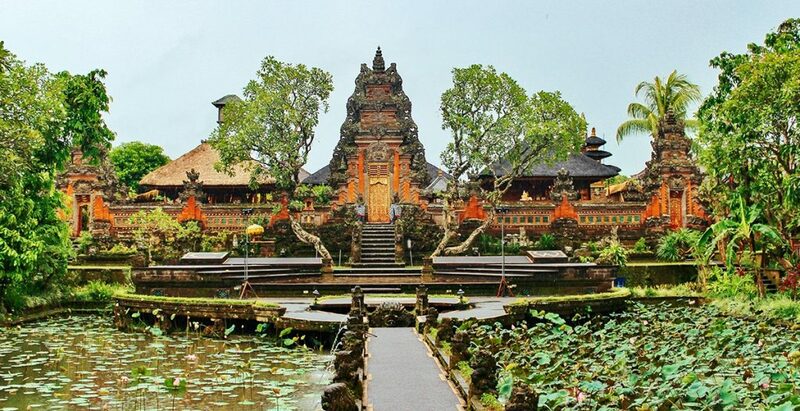 Located near the town of Tampaksiring, this Hindu Balinese temple is ancient beyond belief. It was founded in 962 AD (!!) around a large water spring that is the source of the Pakerisan river. The temple is dedicated to Vishnu and is divided into three sections. 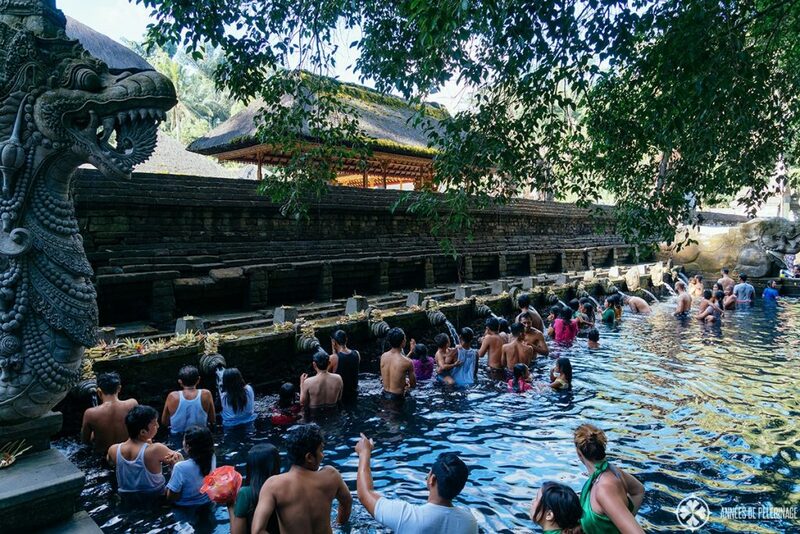 The purification pools are located in the inner yard (called Jeroan), and it is here you see the mass of people showering under the 30 water sprouts as a means of ritual purification. 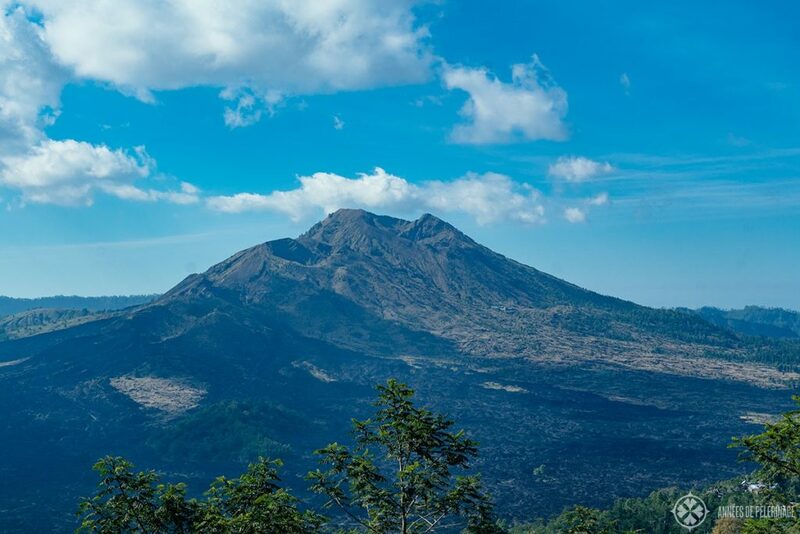 Mount Batur is an active volcano in the East of Bali with an elevation of 1,717 meters (5,633 ft). It is quite active still (though the last eruption dates back to 2000), and you can often see vents of sulfuric steam at the top. 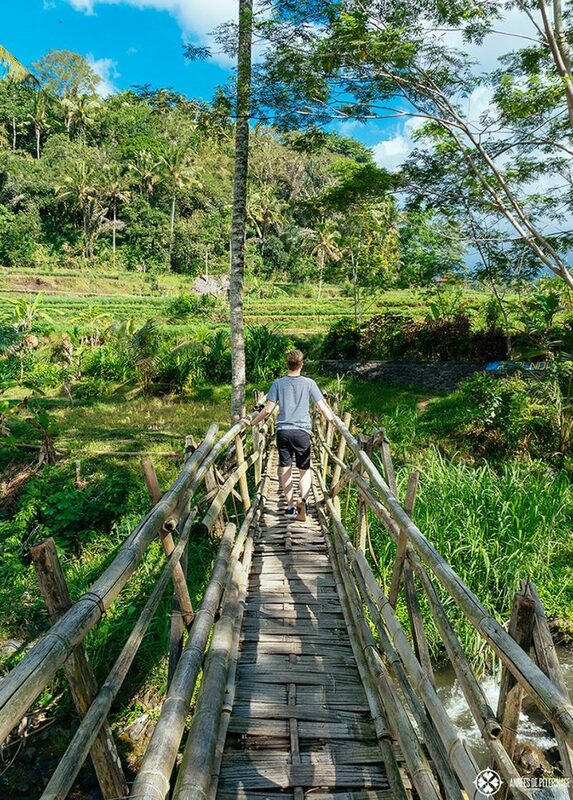 If you are looking for adventurous things to do in Bali, this is as best as it gets! 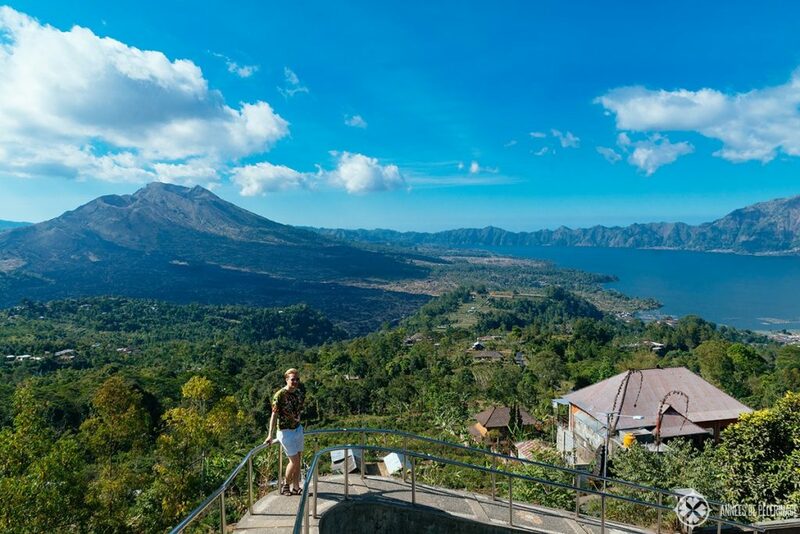 It is possible to climb Mount Batur, but you might as well just enjoy the view across the beautiful caldera from the viewpoints along the road circling the Danau Batur lake. I heard that watching the sunrise from there can be magical! Of all the beautiful temples in Bali, the Pura Tanah Lot (“Tanah Lot Temple”) certainly boasts the most impressive setting (in my opinion, not even Uluwatu comes close). Located only 20 kilometers to the west from the capital Denpasar, you can’t stop marveling at the sight of that little rock outcrop in the middle of the churning ocean. Note that this temple is quite popular among tourists as well. But it is, nevertheless, a magical place to watch the sunset! 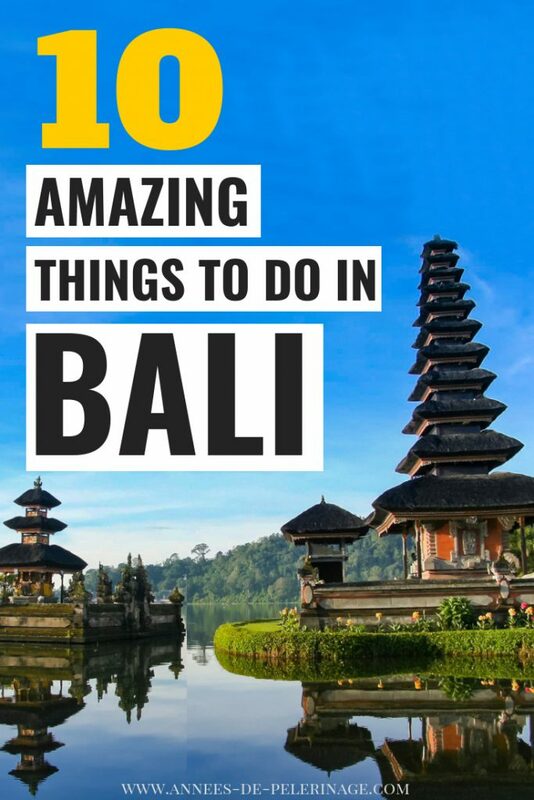 Also, it’s only one of the many things to do in Bali Seminyak area! There are a couple of other temples worth noting, a water park and quite some many popular beaches (like Kuta Beach or Double Six Beach). 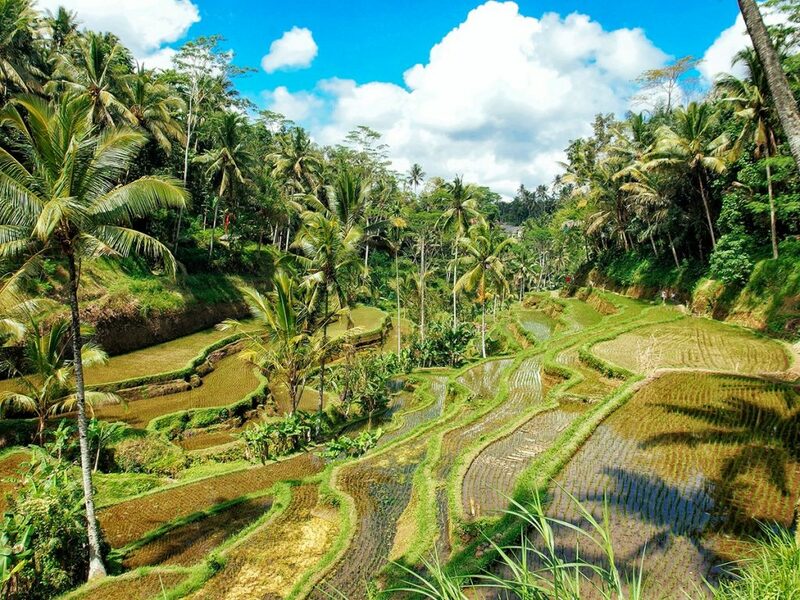 Ubud is a wonderful area you absolutely have to put on your list of things to see in Bali. It’s famous for its wood carvers and traditional handicrafts, but especially for its rice terraces. The Ubud Palace is the crown jewel of the place and once was the official residence of the royal family. Here is a link to the official website. The tropical garden of the monument built at the beginning of the 19th century is particularly noteworthy. But remember – it is just one of the many points of interests in this area. Set some time to shop souvenirs when you are in the area. Or attend one of the many festivals sprinkled throughout the year. Bali is as verdant as it gets. There are rice paddies and rivers all over the island, and of course, there is a waterfall around every corner. 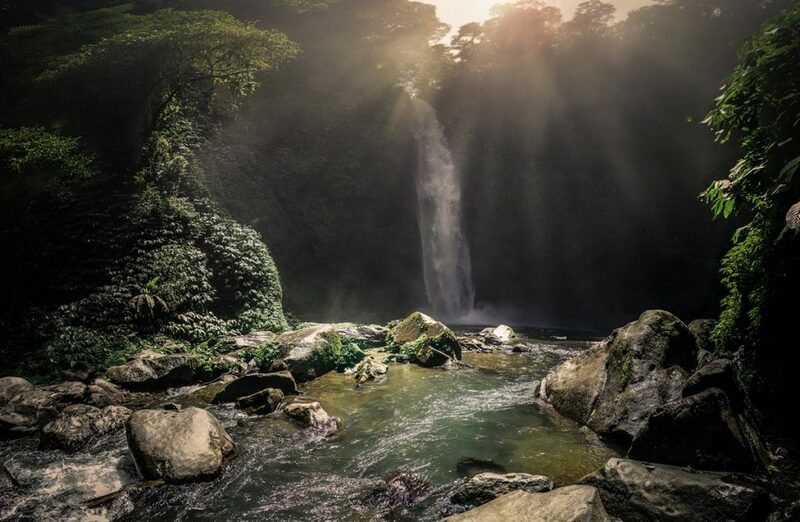 The best area to go ‘chasing waterfalls’ is by far Sukuwati. There is Tegenungang, Kanto Lampo, Blangsinga, and Tibumana waterfall – all within a couple of miles. Now, mind you, there are other waterfalls around Bali. I just found Sukawati to be the best area to find them, especially as it’s so close to Denpasar or Ubud. Now, this list of things to see in Bali, Indonesia, is actually already quite long, but there is more. 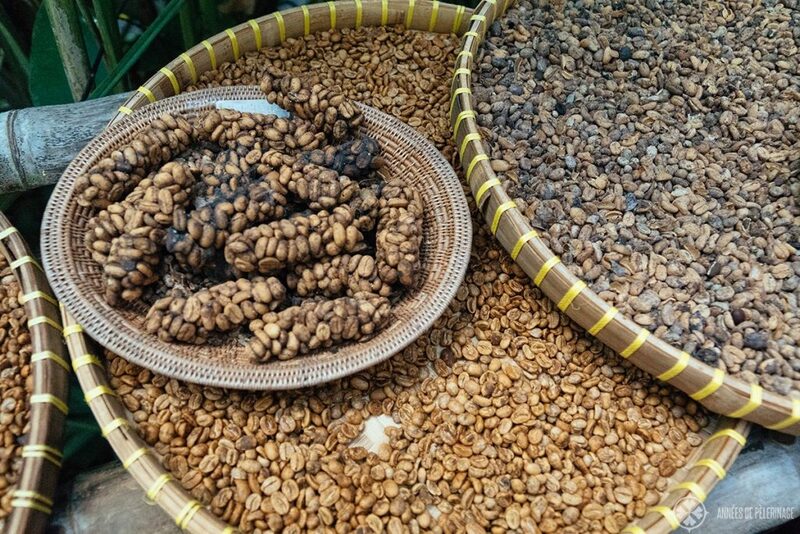 Bali is famous for its coffee, especially Kopi Luwak or civet coffee. This coffee is part-digested by the Asian palm civet, then meticulously cleaned and only then roasted. You will find it in most tourist places, and it’s probably something you should try (please know that some civets are mostly held in cages, so vegans would probably not want to drink it). You can even visit the coffee plantations in some places. Some of them are more like a zoo, with bees, birds, and monkeys. Bali also is famous for its many bars and restaurants, particularly among expats and digital nomads. So, while you are in the area of Ubud or west of Denpasar, make sure to check out the many beach clubs and beautiful restaurants. There are so so many things to do in Bali at night! You should also know that Penida Island (situated between Bali and Lombok) is a beautiful day trip option by ferry or private speedboat. The Gili islands are also a popular destination, though they are a bit more inaccessible and are better explored from Lombok. Both are excellent diving and snorkeling spots! Bali isn’t all that big. Roughly 150 kilometers wide, covering an area of around 5,780 square kilometers (2,230 square miles). There is a ring road around Bali, but as it’s the only road, traffic is usually quite thick, with frequent traffic jams around Ubud and Denpasar. Scooters or motorbikes are actually the fasted way to do your Bali tour, though not necessarily the safest. 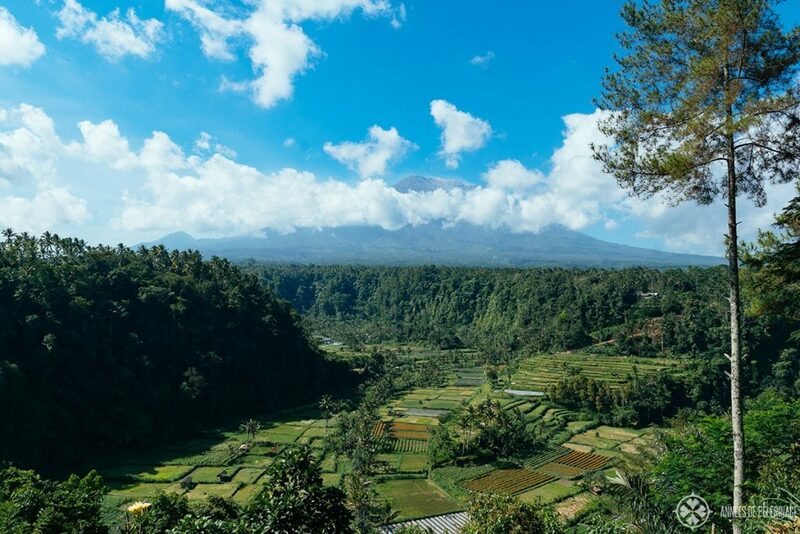 If you don’t want to move around that often, then the capital city (Denpasar) is probably the best area to stay in Bali, as it’s relatively central, and both Ubud and the magical East can be visited on a day trip. 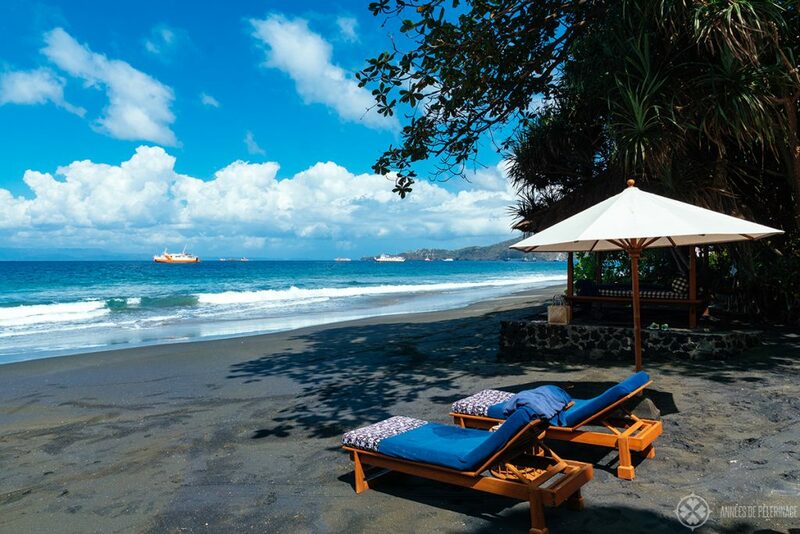 The best hotel in Bali is by far the Amankila in Manggis (East). 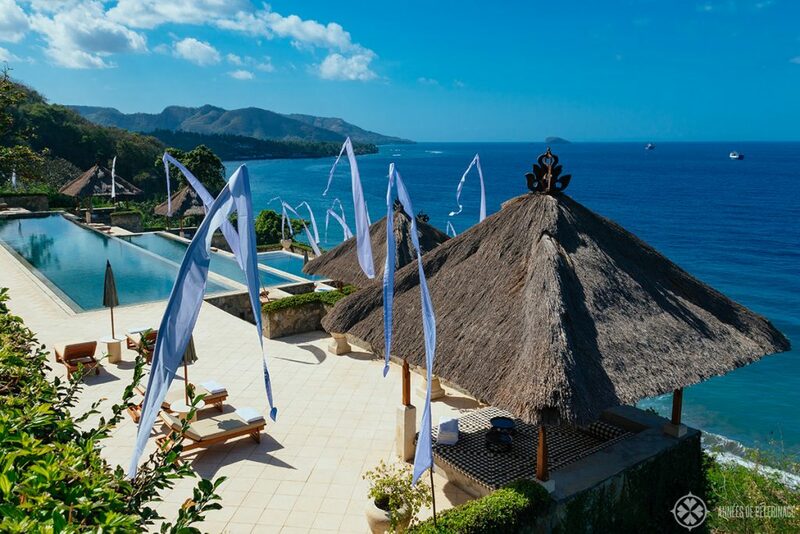 The infinity pool atop the cliffs is probably one of the most beautiful in the world, the private luxury villas beyond perfect, and this part of Bali is not as overrun with tourists. You can read my review here for more pictures & a detailed description of this outstanding property. A very beautiful hotel I can recommend from my heart is the St. Regis Bali (click here for a direct link to booking.com), south of the capital. It does not only have a spectacular white sand beach, it also boasts spacious villas and a gigantic pool area. 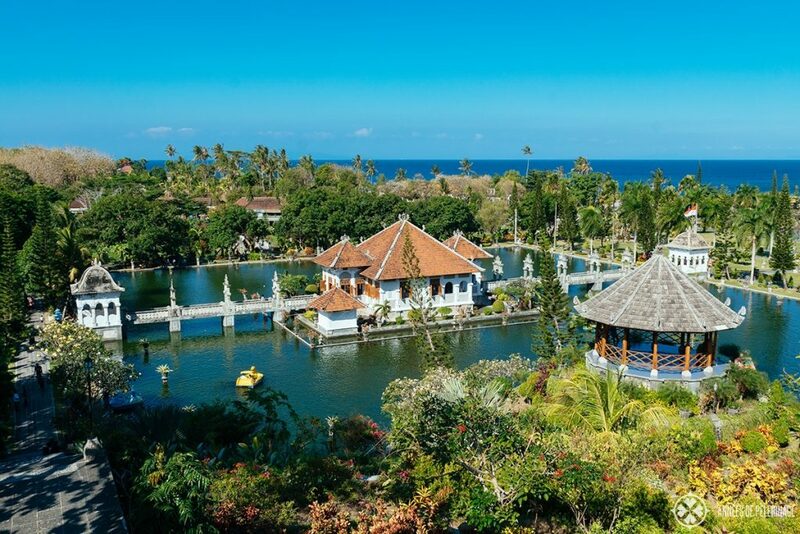 It’s certainly not the cheapest hotel, but as Bali is famous for its luxury resorts, you really shouldn’t miss out that side of the island. Four Seasons runs an incredibly resort at Jimbaran Bay (click here for current prices & more pictures). I haven’t slept there, but as I have stayed in so many four Seasons hotels over the years, this one is bound the be spectacular! Four Seasons is probably the best option for families traveling with small kids, as the hotel chain in general tries everything to accommodate even the smallest travelers. If you like it a bit more authentic, then I can absolutely recommend the Oberoi Bali (click here for current prices & pictures). It might not have a spectacular pool, but as it has access to one of the longest and most beautiful beaches in Bali, that certainly doesn’t matter all that much. I really love the rustic interiors. Bali is a tropical island just a couple of degrees short of the equator (8° to be quite precise), so temperatures are almost the same around the year. Same applies to the water temperatures, which is around 28° Celsius / 82.4 Fahrenheit. 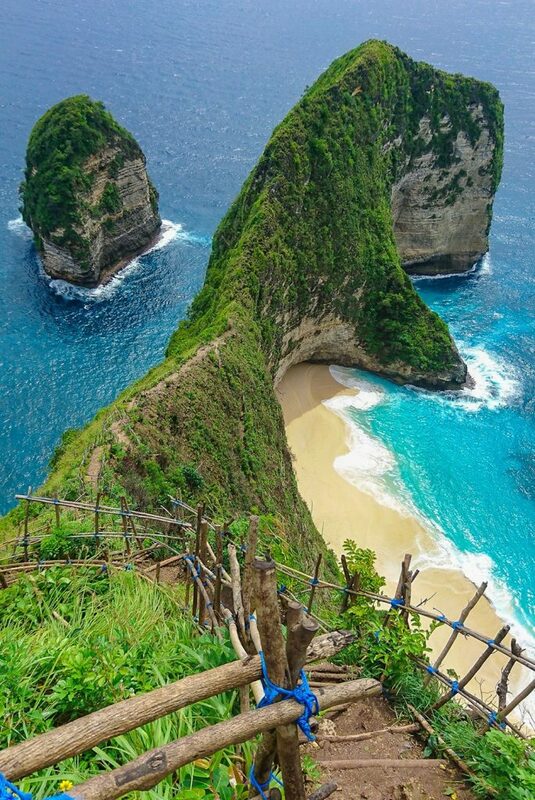 The best time to visit Bali is in the summer months between June and September. This time of the year is also called the dry season. Personally, I’d try to stay away from July and August, as Bali will be packed with international tourists who enjoy their summer vacations. June and even May are also perfectly dry, especially as the rain showers will be quite pleasantly warm. So, when is the wet season in Bali? The height of the wet season is between December and March, with April and November as the transition months. With an average of 13 to 16 days of rainfall per month, this is not exactly the best time to visit Bali. While it is possible to visit, please realize that it rainfalls can last a couple of days in Bali (unlike on other tropical islands). Snorkeling is usually not possible during the rainy seasons, and hiking activities may be canceled due to a high chance of landslides. Bali is, all things considering, quite the conservative island. The locals are used to tourists running around in sleeveless and midriff-baring tops, so there really is no need to fuss around. The only exception is temples, where you will be required to cover your shoulders and sometimes even wear a sarong (can be rented or bought for cheap). Also, realize that Bali is a tropical island with a very high humidity (especially in the wet season). So, bring a waterproof bag (I am using these ones) or some other means to keep your electronics dry can be quite the smart move. If you are visiting in July, you probably won’t need it, while in December you will thank me! You might also want to bring a flashlight. Earthquakes can and do occur in Bali quite often and it often leads to a power outage. If you are staying at a luxury hotel, you probably won’t need to bother as they usually provide a flashlight in your room (at least from my experience). Depending on the electronic devices you are bringing and where you can coming from, you may need a step-down converter (mostly people from the US; This one is cheap and does the job). The recharger of your mobile usually can handle the other voltage, while your hair straightener or dry-blower probably won’t. Note: Depending on the device you are trying to run, you may even need a more powerful converter. So, this was my list of the 10 best things to do in Bali, Indonesia. Hope I was able to help you plan your Bali itinerary. Got any questions? Comment below. And don’t forget to pin this to your Pinterest board!